VATICAN CITY (CNS) — Cardinal Angelo Scola of Milan is a tweeting, intellectual archbishop deeply concerned about the negative impact modern culture is having on the faith lives of Christians. He also is convinced that Christian values have the potential to build societies that are more virtuous and more respectful of the rights of all. Almost any discussion about potential new popes includes the 71-year-old, who is the most prominent head of an Italian diocese. Milan is the country’s largest see and the archdiocese led by both Popes Pius XI and Paul VI before they were elected to the papacy. Before being transferred to Milan in 2011, Cardinal Scola was the patriarch of Venice, once the archdiocese of Blessed John XXIII. Cardinal Scola has made social and cultural involvement in the civic life of both cities a key part of his pastoral ministry. The son of a truck driver, he has tried to rebuild Italian parishes in an attempt to restore their traditional role as a spiritual and social meeting ground. “Why are the people lost? Why is the community weak? Because I think we have forgotten a little about the basic elements of the human being — his emotions and desires, how he lives concretely, how he experiences work, marriage, the family and his neighborhood,” he said. Cardinal Scola has argued that if the church wants to reach people where they live, it has to move out of the sacristy and into all sectors of civil society. But the cardinal recognizes Catholic involvement in social life is increasingly unwelcome in the West. In a December speech, Cardinal Scola said most modern democracies have ended up hurting religious freedom in their effort to be “neutral” toward their citizens’ diverse beliefs. Under the guise of “objectivity” and respecting diversity, many governments are really upholding and giving legitimacy to a culture that is devoid of God and hostile to the church’s legitimate place in the public square, he said. The cardinal has not claimed a privileged place for Catholicism in the public sphere, but has advocated for the right of all believers to engage in public debates, as long as they do so with civility and respect. In 2004, he founded Oasis, an international foundation that acts as a forum for dialogue and a bridge of support for Catholics in the Middle East. It publishes a journal and hosts international conferences attended by experts on Islamic-Christian relations. While recognized as one of the church’s deepest thinkers, he also has a reputation as one of its wordiest speakers and one who sometimes has difficulty making his thoughts accessible to a broad audience. People can find even his briefest remarks difficult to penetrate. An Italian magazine and media company teamed up in January to study the Twitter activity of Cardinal Scola and seven other tweeting cardinals. 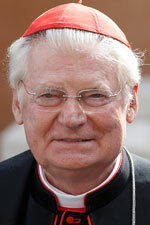 They found that Cardinal Scola’s followers re-tweeted only 40 percent of his 140-character-maximum messages. By comparison, 100 percent of the messages sent by Cardinal Timothy M. Dolan of New York are passed on to others by his followers. Cardinal Scola’s concerns about the role of faith in culture have deep roots in his expertise on Catholic teaching about anthropology, sexuality and family life. In 1982, he was named professor of theological anthropology at the John Paul II Institute for Studies on Marriage and the Family, based at Rome’s Pontifical Lateran University. He also taught contemporary Christology at the university and has been a visiting professor at the John Paul II Institute for Studies on Marriage and the Family in Washington. In an interview last year with Famiglia Cristiana, an Italian Catholic magazine, he insisted it was inaccurate and even a sign of a lack of faith to act as if the battle to save the traditional family already had been lost. What is true, he said, is that modern men and women face a choice. “Overcome by the rapid multiplication of phenomena like globalization, the Internet civilization, progress in the neurosciences and biotechnology and the mixing of cultures, humanity is called to choose what it wants to be — and it cannot avoid doing so. Does the person want to be ‘one in relationship’ or, as some propose, a pure experience of the self?” he said. Cardinal Scola said people need help and support each other in learning how to love and forgive one another, especially in a culture that tells people it is fine to walk away if they are not completely happy. “To quickly bury a relationship, even though it may be painful, is not a solid basis for building one’s future,” he said. Born in Malgrate, Italy, Nov. 7, 1941, he attended high school in Lecco and studied philosophy at Sacred Heart University in Milan. After his ordination in 1970, he worked with two famous theologians, Fathers Henri de Lubac and Hans Urs von Balthasar, when they founded the international Catholic theological review, Communio. He eventually published book-length interviews with both theologians. At the University of Fribourg, Switzerland, he became an assistant researcher in the philosophy department in 1979 and later an assistant professor of moral theology. In 1991, Blessed John Paul II named him bishop of Grosseto, Italy, and four years later asked him to return to Rome to serve as rector of Lateran University and president of the John Paul II Institute. He was named patriarch of Venice Jan. 5, 2002, and was made a cardinal in 2003.